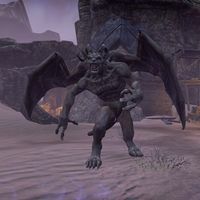 The Monstrous Gargoyle is a gargoyle boss of Volenfell. It is initially atop the Dwemer door before being awoken by Quintus Verres late in the fight, jumping down to attack the group. This boss is associated with several achievements. This page was last modified on 2 February 2019, at 00:01.